The Low Impact Decaf was blended and roasted for you by Kickapoo Coffee Roasters. 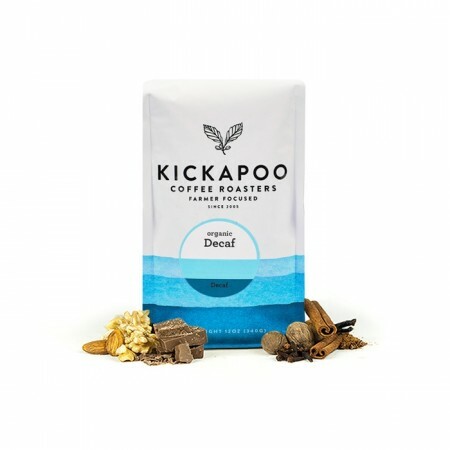 This decaf coffee is Organic certified and was fully washed before being decaffeinated using the chemical-free water process decaffeination method. The cup is creamy and smooth with notes of chocolate, caramel and nuts. Probably a little bit too darkly roasted for my tastes. I prefer a little bit fruitier coffee and for a pourover or immersion brew I lose some of the flavours when it's darker. One of the most outstanding decaf coffees I've ever had. Perfectly roasted, medium with complex flavors and a mild delicate Citrus flavor. Loved it. Not sure if it is the way I'm making this one but it's got a slightly weird taste to me that I can't quite put my finger on. Good, but not great overall I'd say.